wide media coverage (including in a TVB documentary series) and burgeoning demand from the public for CLE service has been received. The programme's philosophy is to equip law students not only with competent lawyering skills and legal knowledge, but also with a heart to serve the needy with professionalism and dedication. 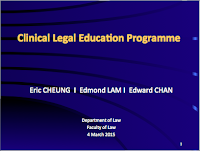 This programme adopts a learning by doing as well as a discipleship approach, which serves to supplement a lacuna in traditional classroom teaching in law. It provides a unique learning opportunity to students to experience first-hand how the legal principles and system operate in reality and to provide meaningful service to the public, thereby inculcating a pro bono culture in their hearts. The programme was featured in a China Daily article in September 2014. 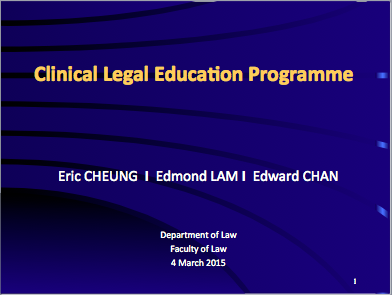 Click here for more information about the CLE programme.